Dave Zeltserman has written some great crime noir books over the past dozen years or so, and I eagerly await every single release of his. In addition to his noir books, he has dabbled in horror, super natural, and mystery as well. 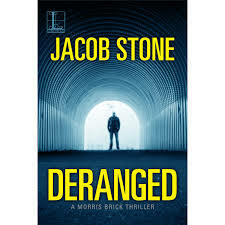 His latest release, the first in a planned thriller series, is being released under the pseudonym, Jacob Stone. The idea behind the switch in names is to differentiate the series from his previous body of work. For me, the name Dave Zeltserman calls to mind books that are well-plotted, have great character development, and grab you by the throat and force you to finish them in one sitting, so I scratch my head at the name change, but I am excited to say nothing other than his name has changed; his writing style still lives up to the billing! This series comes out of the gate swinging with the first offering, Deranged. The series is built around Morris Brick, the leader of an investigative firm, who is tasked with helping the LAPD investigate and solve the SCK (Skull Cracker Killings) case. Brick is a no nonsense main character with strong morals and a bulldog mentality when he locks into a task. His determination and grit are apparent throughout the novel and this makes him a great protagonist for a thriller series. I loved the manner in which Stone (Zeltserman) fleshed out the killer himself. The backdrop to why the killer does what he does allows his actions to make sense and allows the reader to, if not connect with, at least understand him and his motivations. The usage of flashbacks to the killer’s youth were well paced and added a nice layer of action to the story. A nice usage of twists and turns also adds depth to the story of the deranged killer on the loose. The surprise twists in the motivations of the killer really helped keep me engaged in the story. The first book for any series is an important one, as it needs to hook the reader so they not only enjoy the book itself, but have a desire to seek out the next books in the series. The main characters need to have room to grow and evolve, and I hope to see Brick have a long shelf life with a bit more of his backstory woven into the series. This book had me engaged and while I think Zeltserman is at his best when writing dark noir, I found this book to be another winner for his catalog.